The main proponent of the Never Say Die philosophy of the Barangay Ginebra Team, Sonny Jaworski, never fails to touch the hearts of the millions of Ginebra fans whenever he speaks. This time, via the family maintained Facebook Fan Page of the Living Legend, Jawo poured his heart out in a letter that he wrote for his beloved fans. He acknowledged the impending entry of the 3 new PBA teams, congratulated PBA Commissioner Atty. Chito Salud, urged the fans to continue supporting the league, and highlighted the importance of the "Never Say Die Attitude." 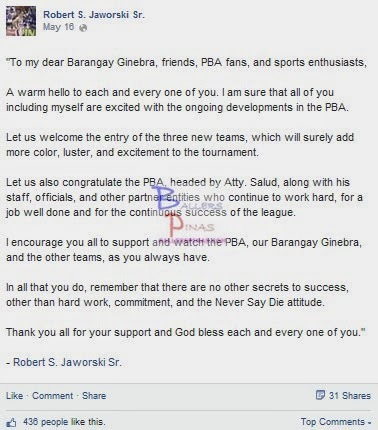 This letter is a must read if you are a true blooded Ginebra fan. And oh, don't forget to share this to your fellow GSM fanatics. Thanks in advance! A warm hello to each and every one of you. I am sure that all of you including myself are excited with the ongoing developments in the PBA. Let us welcome the entry of the three new teams, which will surely add more color, luster, and excitement to the tournament. Let us also congratulate the PBA, headed by Atty. Salud, along with his staff, officials, and other partner entities who continue to work hard, for a job well done and for the continuous success of the league. I encourage you all to support and watch the PBA, our Barangay Ginebra, and the other teams, as you always have. In all that you do, remember that there are no other secrets to success, other than hard work, commitment, and the Never Say Die attitude. Thank you all for your support and God bless each and every one of you." - Robert S. Jaworski Sr.